I've really battled with myself, this morning, over writing this post. After being awoken to the news that the, immensely talented, Robin Williams has allegedly committed suicide. So why have I struggled to write this? Because this is me, opening myself up. There will be parts of this that my family didn't know, that only my husband has got me through. For that I apologise, I would never have been able to admit some things face to face. To the friends that only really speak to me on-line, that I make excuses not to go out with, I apologise, I've never been able to open up to you, to let you in, for fear of reprisals. 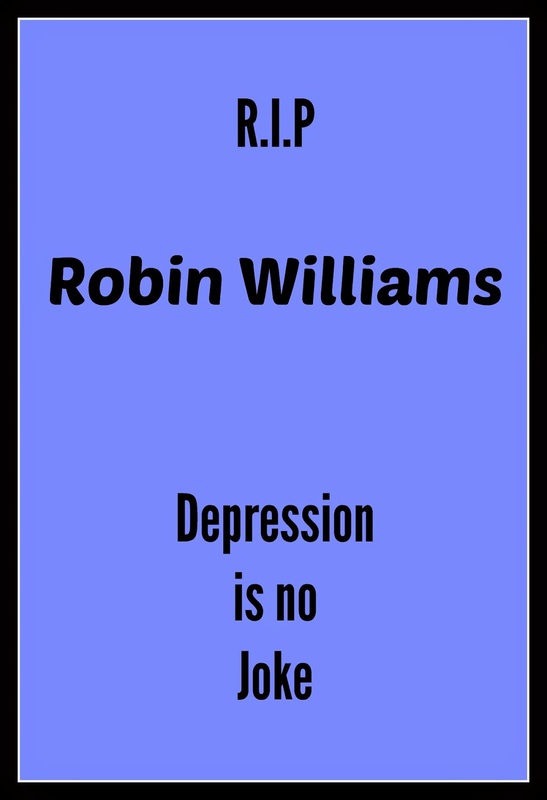 He never admitted that he had depression. He admitted that he had drug and alcohol problems, often put himself into rehab. He admitted he was slightly 'manic', yet never admitted depression. So here it is.....I suffer with Depression. I have done for most of my adult life. I have been medicated to varying degrees, over the last 16-20 years. I have had some truly rough moments in my adult life where ending my life has seemed like an option. It has never been spoken about, outside of my own four walls, before now. The closest I came was when I was working, approx, 30 miles from home. I used to close my eyes sometimes, while driving down the motorway, late at night. I used to think that, because no one else was on the road, nobody else would be hurt. I could actually see myself rolling through the field, next to the M4. I have seen myself unable to talk, at the simple idea of going to work. To the point where I gave up my job, on a whim. I tell people I gave up because I was pregnant on my 3rd. That's a lie. I found out I was pregnant, about, 1 month after I gave up work. I've suffered a few, quite bad, nervous breakdowns. I'm lucky that my husband is a strong man, because he has pulled me from the brink on more occasions than I can count. Can you imagine how hard that is for him? At the moment, I'm at a pretty good place. My meds have been lowered, although I accept the fact that I will never come off them. But I'm ok. I can smile, and I mean it. I don't go out a lot, I tend to keep to myself, and use social networks to stay in contact with people. I am trying to see positives in every day, and that helps, it is also what stops me from venturing out. One of my friends, unintentionally, made me feel very negative about my situation, which has scarred me. I still read far too much into any negative comment, I beat myself up enough, without other help. But I'm still fighting. So many friends will read this, not realising what was lying beneath the surface. I'm not sorry for that, maybe it's the time to open up. For that I have Robin Williams to thank. I hope more understanding comes from his, very untimely, death.